House of Dark Shadows, one of the two full-length movies Dan Curtis produced from his television series Dark Shadows, was shown as episode 121 of Elvira's Movie Macabre on June 22nd, 1986, and was the first episode of the final season. 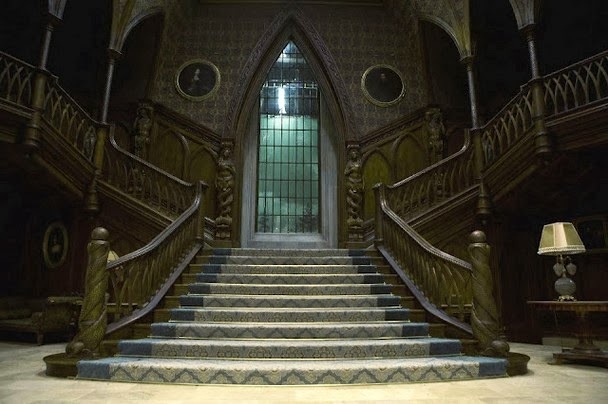 Both House of Dark Shadows, and Night of Dark Shadows starred actors from the series, some playing different characters, and both movies are solidly entertaining, with the added bonus of that spectacular Collins Mansion (and out buildings). I bought both of them on VHS when Express Video went out of business a few years ago, and they get consistent play in my VCR. 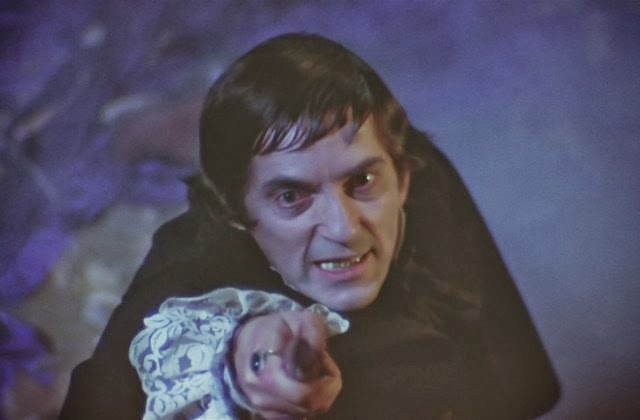 Jonathan Frid reprises his role as vampire Barnabus Collins, this time posing as an English cousin of the family. This shot is one of my favorites in the movie because Frid seems to be addressing the watcher as much as the character in the movie he is pointing at. Although the movie doesn't have any real legitimate scares, this moment is slightly unsettling. This film was shot concurrently with the original Dark Shadows (1966) series. During the time of filming, the television program was in the middle of its 1970 parallel time story-arc. Major characters appearing in the film were written out of the TV series so that they would be available to shoot the movie.